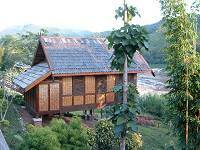 The Luang Say lodge in Pakbeng came into view about 4 o’clock in the afternoon. Because it is dry season in December there was a long climb up from the boat landing to the lodge, but once we stepped into the reception of the lodge the view below is magnificent. The landscape of the Mekong River & the mountains beyond seems like a beautiful Chinese silk painting. The sunset makes a stunning picture for any photographer. The lodge accommodation is made up of individual bungalows, which are large and have bathroom facilities at the rear. There is no television in the room, but in the evening there is a dance & music performance before the buffet dinner. Next morning we rose with the birds for a simple breakfast of eggs, coffee & bread and headed off for a very pleasant 20-minute walk down into Pakbeng to the local market, meanwhile the cruise boat was moving up to town from the lodge to pick us up for the next stage of our journey. 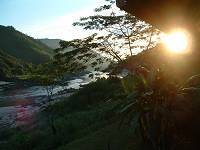 We were now on our way to Luang Prabang as the sun rose, burning off the morning mist. Someone had taken out a mahjong set & we started to play it with some other passengers for few hours until we stopped at a village where rice whisky is made, with a visit to the temple & the many stalls where local women are sell their products. Back to the boat for a buffet lunch. 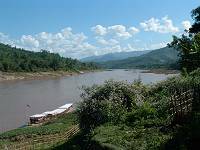 In the afternoon we arrived at the confluence of the Nam Ou River, the Pak Ou caves on the right hand side with many steps cut into the rock. Inside the caves there are hundreds of different sizes of Buddha image all around. 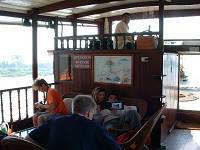 The final leg of the journey from Pak Ou to Luang Prabang took another 2 hours before our arrival at the boat pier. There were many farewells to new friends among the passengers. We had particularly enjoyed the company of a Canadian cattle rancher and his wife, Glen & Starr, throughout our two day trip. We checked in at Villa Suan Mark guest house. Later, our Luang Prabang office manager took us for a meal at the Indochina Spirit restaurant, a charming place set in gardens which we also use for our clients. We sat on wooden floor crossed legged in the Laos style eating mekong seaweed, sweet & sour fish, deep fried pork, oak lam (vegetable & pork) & my favourite: bamboo shoots stuffed with minced pork. We washed it down with Laos beer. We finished the evening with a stroll in the night market, a great place for souvenir shopping. 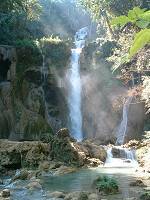 Next morning was our trip to the Tad Khuang Sii Waterfall. On the way we visited a Hmong hill tribe village & Ban Ouh village. It was at Ban Ouh village that we were welcomed into the village hall where a Lao 'Ba Ci' ceremony was taking place. A local family, father & daughter, were about to leave Laos for Japan. 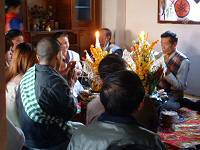 The village people including friends & relatives were performing the Ba Ci ceremony to send them away with good luck & good wishes. Prayers was said and a lot of raw rice was thrown about in a happy & joyful atmosphere. The village people were extremely pleased that we were interested to attend their traditional ceremony. It was great fun & I have never enjoyed myself so much with a group of complete strangers. They made us welcome and I felt part of their family & village. At the end of the ceremony the villagers tied many lengths of white string around the wrists of father & daughter and also came to do ours - our wrists ended up with about 10 knotted strings on each which we kept on for good luck until we arrived back in the UK. I am still smiling writing this down as the happiness of those villagers recorded itself deeply in my mind and I will treasure this experience all my life. We were invited to stay for lunch but had to decline and make our way on to the waterfall where we enjoyed our picnic lunch. 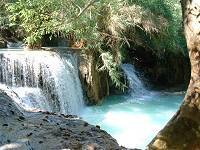 The water cascades down into a series of turquoise pools. One can change in a nearby changing room for a dip into the cold water which has a clear blue-green tint due to the high mineral content. We were expecting a sandwich & fruit for lunch but our guide & driver laid out a whole tableful of dishes of fried chicken, laos sausage, pork with carrots, beef with green peppers, mixed vegetables & rice. It was presented like an outdoor mobile restaurant, and followed by fruit & coffee. Most impressive for what they called a picnic lunch. We drove back towards town, calling at the Villa Santi Resort to revisit, and were pleased to find that this hotel, popular with our guests, is now improved since our last visit, the lovely swimming pool having been completed, and the hotel seeming altogether more 'established'. Next up was a visit to the new Maison Souvannaphoum. This former residence of a member of the royal family had been a hotel, but very run down. When we visited 2 years ago it had closed for refurbishment. Now the hotel is beautifully refurbished in elegant design with local culture & material throughout. The hotel manager, Mr. Cavory, emphasises that it is a 4* boutique hotel but we are offering it our Deluxe category. We caught a late afternoon flight to Vientiane. Before we checked in at the Intercity hotel, we inspected a lovely new 4-5* boutique hotel called the Green Park, a welcome addition to the Vientiane scene as there are not many top-class hotels. It is the first luxury boutique-style hotel in Vientiane, beautifully designed and very chic. I felt like I was stepping into a palace courtyard in the middle of the city. From the elegant lobby we walked through a waterway of plants & wall paintings to the restaurant which looks out to a large ornamental pool and a swimming pool. The beautiful rooms have balconies or terraces overlooking the pools, and have lovely bathrooms is built with windows looking into inner private gardens. This is magnificent and we immediately add this hotel to our list in the deluxe category. We went to bed early on New Years Eve because we had to rise before dawn the next day for our Vientiane to Siem Reap Flight at 06:30am. Many local international & domestic flights start early in the day in South East Asia.